Did you know the color red stimulates the appetite? 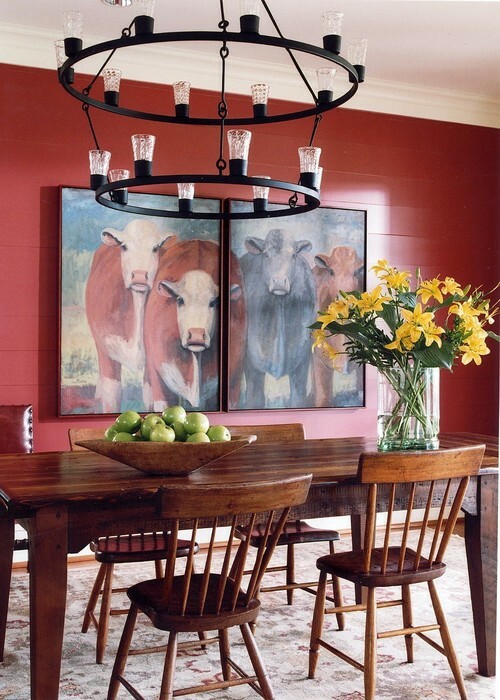 This dining room is sure to put people in the mood to eat with its red walls. But what I love most about the space is the cow artwork. Although, you might not feel comfortable enjoying a juicy steak with that moo-crew looking down on you. A pair of friendly cows in soft colors peer over a family room. 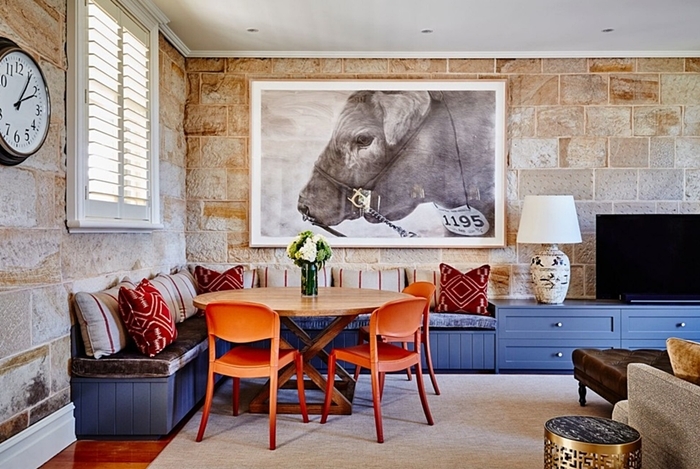 Cow decor doesn’t have to be in the form of a painting. 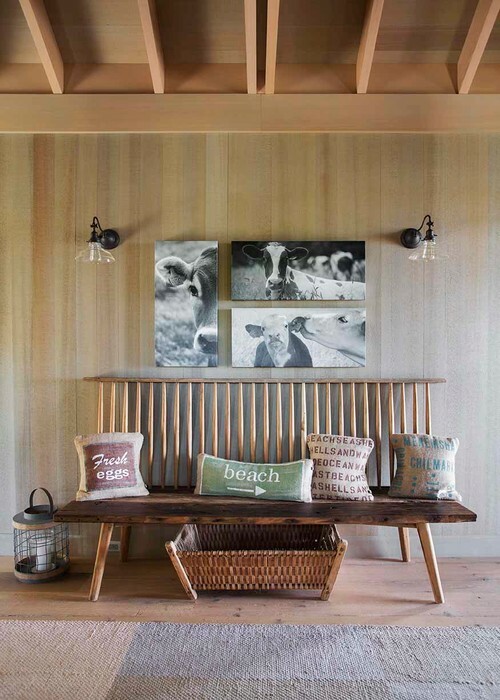 Photos stretched across canvas make an appealing display above a primitive bench lined with rustic farmhouse pillows. I love oil paintings like this pastoral view of cows in the field. It’s rich and adds drama in a pastel bedroom. 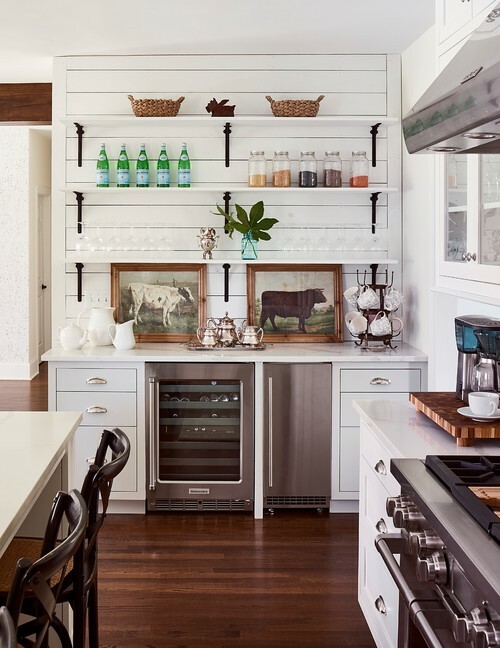 This room leans toward the coastal style but the cow decor gives it farmhouse flavor. 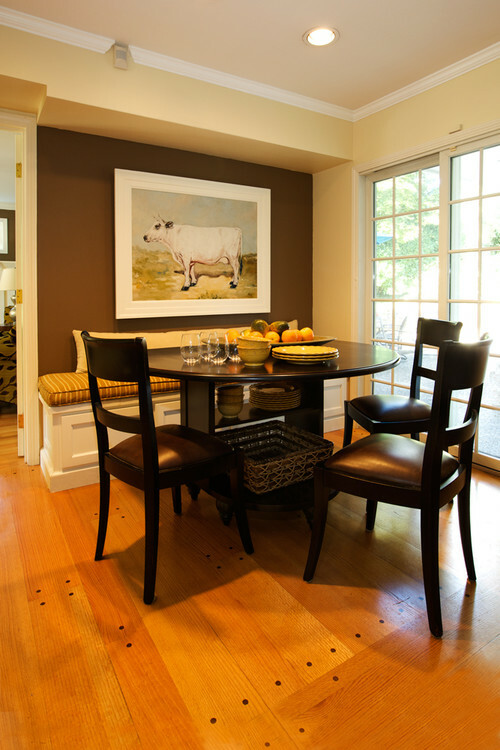 A cozy breakfast nook gets the farmhouse look with a white cow painting centered on a chocolate brown wall. 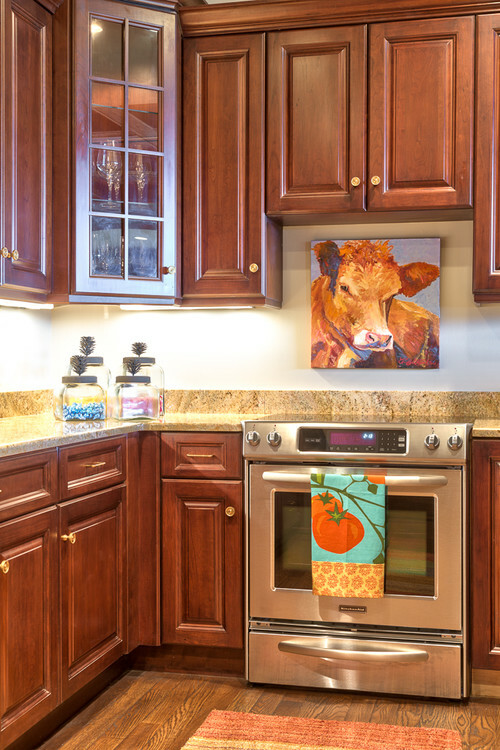 Add a small cow painting in the kitchen. Don’t be afraid to fill a wall with a large photo of a farm friend. Cow decor doesn’t have to hang on the wall. Lean a pair of cow prints against the wall. 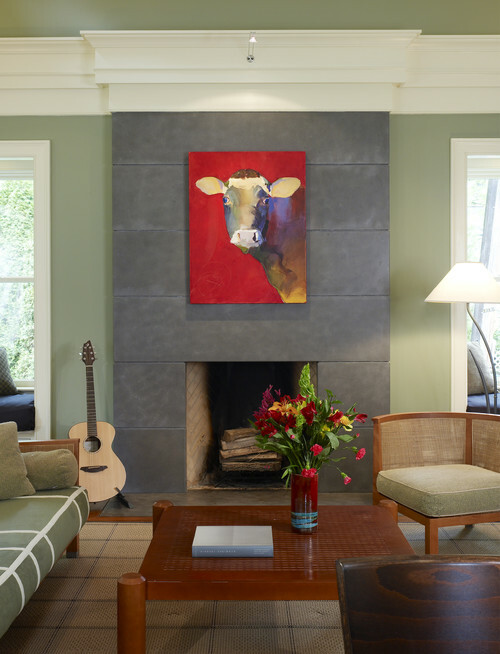 An oil painting of a bovine friend nestles on a stone mantel, lending farmhouse charm to the room. A white cow takes residence on a dark canvas. I recently purchased this same print for my house. I haven’t decided yet where I’m going to hang it. Maybe the family room. Rather than clutter a wall with lots of prints or hangings, place one charming painting on the wall. If it’s a cow, all the better for adding farmhouse style. 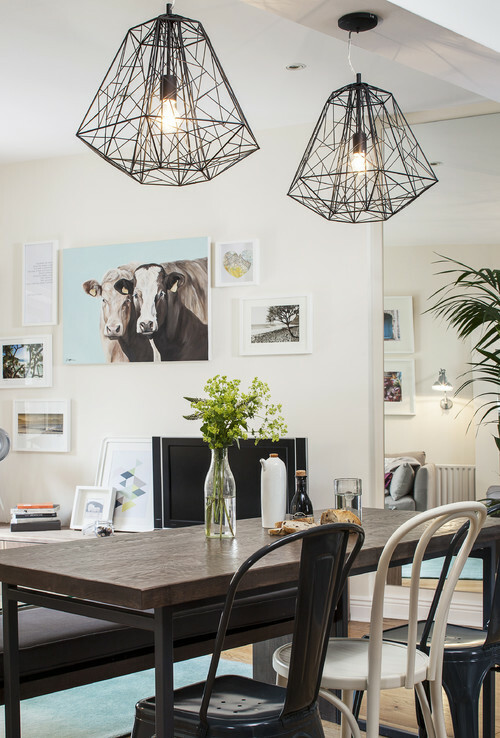 A contemporary cow print works well in a more modern space, proving you can get a bit of the farmhouse look with almost any style decor. 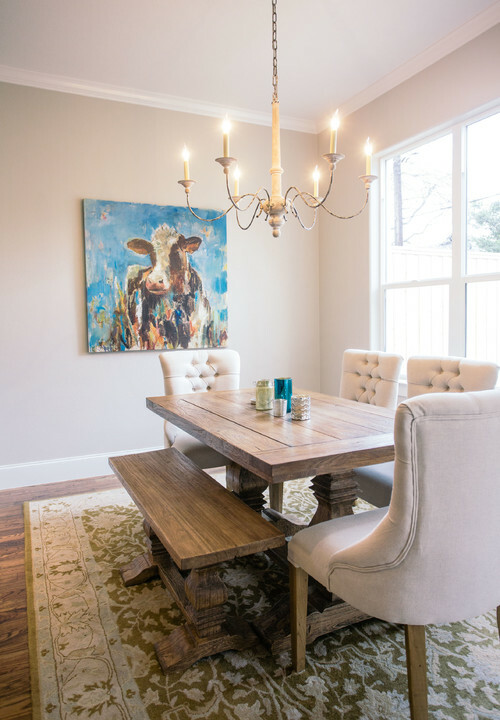 Photo by Merrick Design and Build Inc.
Do you have cow art or any other farmhouse animals in your home? Congratulations to Mary K – the winner of the Romantic Prairie Style book!! “Moo crew.” Now that’s funny! Who knew cows could be so cool??!!! My family room fireplace is adorned with a larger canvas cow called Farmhouse Cow with Rose. It’s by artist Debi Coules that has a pretty comprehensive farm animal theme, some with whimsy, some not and I absolutely love it. I also have a cow head, about 8″ casted metal with a bell under its head, bought at TJ Maxx on sale! 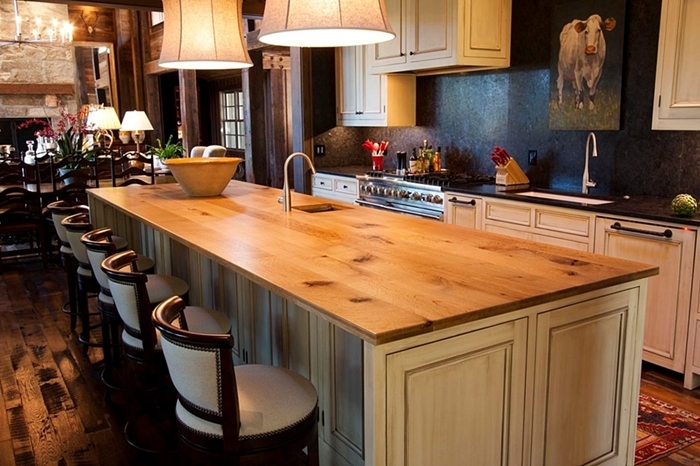 Love the farmhouse look!! Thank you, thank you. Love this look, been looking for cow art for our snug and think I have finally found it, your picture three! I am going to take some photos of our own herd and have them printed on canvas, yah! I have bovine love in my heart, and we have several cow paintings as well as a few other bovine details. Love the bedroom with the painting. I wanted to add it to my Pinterest Board. I used your Pin button at the bottom of the post, but I get a message that says you don’t allow images to be pinned. What’s not to like about a big-eyed cow? You have shown a good variety of pictures. When I worked in the interior design studio/furniture store, the owner had some gorgeous paintings of cows, sheep, horses, and poultry. What is not to love about a cow munching away peacefully in the barn or the field? Lovely bovines!!! We live on a large farm in central Missouri and raise cattle. I have a huge canvas on our dining room wall I took of a cow in the sunset. It’s an awesome picture and I have others in our home. I get so many compliments on them. I got the real deal, all I have to do is walk outside to get a cow picture. Now I wish I had a farm! Old McDonald would be pleased with these neat and fun images. Even though images of cows probably won’t make it onto my walls there was one picture I really liked. It is the one with the blue corner seating / storage built-in. I have something similar and it needs sprucing up. I think I will add “painting the corner cabinet” onto my project list. This blue ones looks very inviting. Love, love, LOVE cow decor. I have cow pictures in my laundry room. They make me smile whenever I’m working on that boring but constant task.